‘Tis the season for DIY holiday decor! I had a bit of a rough day a few days ago (can anyone relate?) so my sweet Mr. Handsome encouraged me to treat myself. 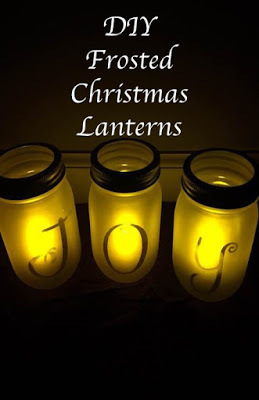 I think he had a latte in mind, but I opted to head to the craft store to buy supplies to make DIY Christmas lanterns. The process was simple, but I am so pleased with the results that I just have to share the tutorial with you. 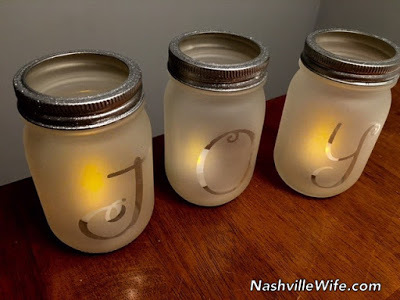 I followed The Budget Decorator’s DIY Mason Jar Holiday Luminaria tutorial, but I made several tweaks that made the process even simpler. 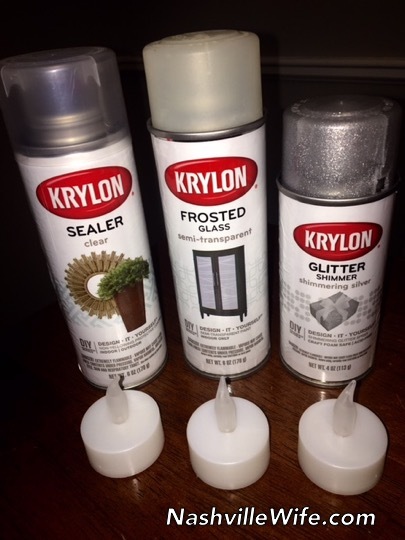 After placing a letter sticker on each jar, I did 3 coats of frosted glass spray paint, waiting 15 minutes between coats. (It is really important to follow the instructions on the spray paint can. If you hold it too close to the jars, the paint won’t be smooth.) The following morning, I did 3 coats of clear sealer spray paint, also waiting 15 minutes between coats. I used the glitter shimmer spray paint on the rims. I opted to forgo the lids, but of course that’s just personal preference. (I like the simple look without ribbon, but you can feel free to add ribbon.) If you do use the lids, I recommend purchasing tealights that have built-in timers, so you don’t have to unscrew the lids to turn them on and off. The downside of tea lights with timers is that it can be difficult to find ones with a decent battery life. I opted for flameless LED tealights without timers. At the recommendation of one of my Facebook followers, I tied fishing line (which Mr. Handsome has plenty of) around the plastic “flame.” I secured the other end under the rims as I screwed them on. To turn the lanterns on and off, I simply reach in and grab the fishing line to pull the tealights out. One more tip. Blasting the stickers with a hairdryer for 20-30 seconds before attempting to peel them off is a must. 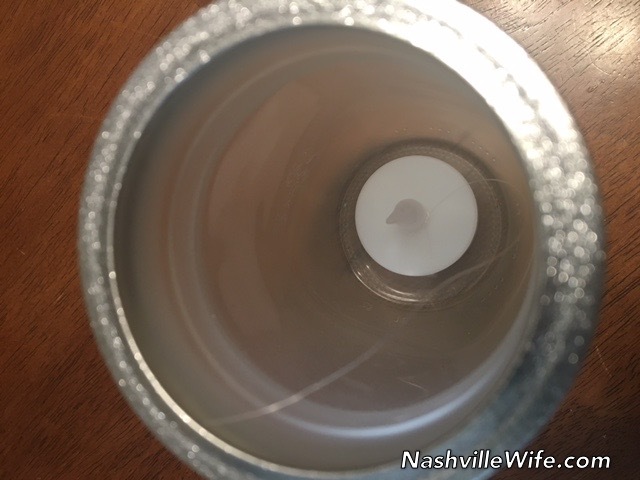 If you pull them off and still see black flecks on the jar, you probably didn’t get both layers of the sticker. (That happened to one of my jars.) Simply blast it with a hairdryer for another 20-30 seconds, and gently use your fingernail to pick at the flecks. You should be able to pull off a full clear layer, and the black flecks should be gone. 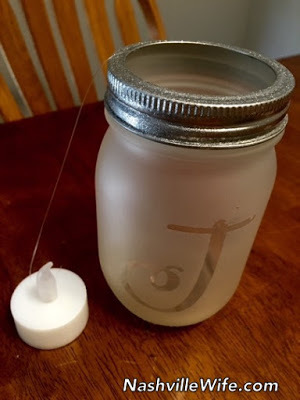 If your stickers leave stickiness behind, allow the jars to set for a few days, and gently use a small amount of Goo Gone on a paper towel to wipe it away. Feel free to choose another holiday word, such as Noel, Rejoice, Hope, Advent, Jolly, or Holly. 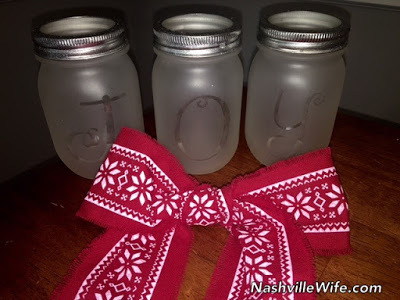 If you’re feeling really crafty (and have a lot of Mason jars lying around), try Merry Christmas or Visions of Sugar Plumbs…Okay, that might be a bit excessive. If you make these lanterns and want to take a minute to email me your photos, I would love to see them! Someone once wrote in my autograph book, "If there is light within your face will be radiant!" As true as that might be these kinds of statements do not add up to the whole one needs for living. Where and how does one get what they need to live, good question. Try answering that. What? On a post about frosted glass jars?? Anon 11/29 who had the autograph book, are you asking a spiritual question? If so, then all your answers can be found in the Bible. You need to trust Jesus as your Lord and Savior. Actually, there are many holy books and many spiritual paths to inner peace and life's answers. Your suggestion (above) is only one of them. But it may not be the original poster's best answer, or the answer for everyone. I would encourage that person to explore for his/herself until he/she finds what he/she is looking for. Remember, not everyone is Christian, or ever needed to be for fulfillment. There are different ways, and it's presumptuous to think that one way is the only way, or to tell someone that they have no other choices. Ap parent ly Christ IS the answer! I read the Anon response and I didn't see his or her response as presumptuous. Many of Ellie's readers are Christians(I said many, not all) so it would make perfect sense to suggest the Bible. There are also some people out there who at this time of the year will seek out Christian resources wondering about Jesus. I agree. The holidays can be very difficult for people. For some they will probably seek out a cnurch or synagogue or in this case, a blog for help. I don't know if the OP is a regular reader or just happen to come here but most regular readers are aware that Ellie and her husband are Christian. The OP was asking a sincere question and the person who suggested the Bible gave a sincere answer. So cute! I love doing DIYs! 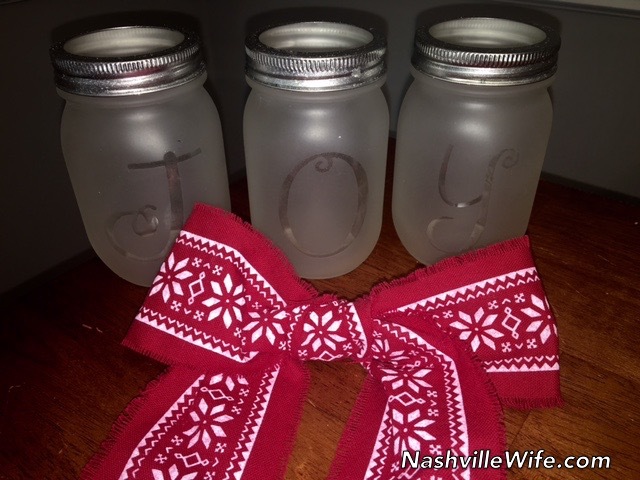 Your JOY jars are beautiful!!! Thanks for sharing. PS – where did you get your letters.